This quilt was delivered to it's owner today. YAY! 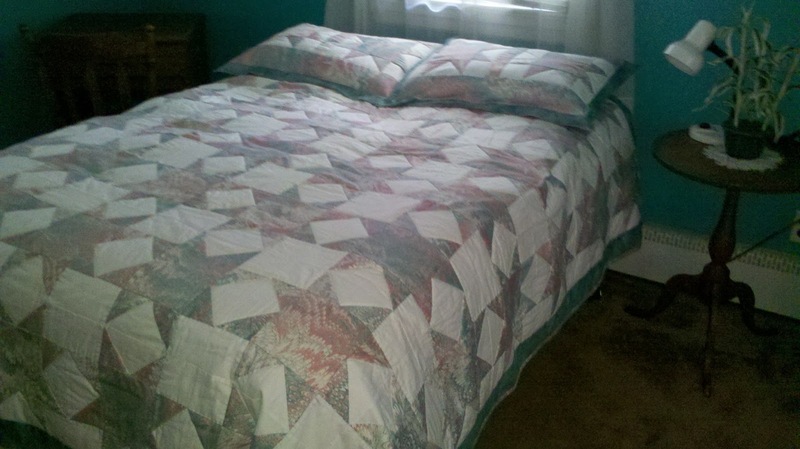 It's an over-sized double bed size quilt called Bachelor's Quarters by Thimbleberries. It is all batiks and was long-arm quilted with a swirl pattern. Just a few of the pretty quilts we saw at a local quilt show. 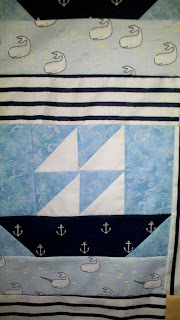 I want to make each one of these some day :) Love the button "sunshine" in the first quilt. Isn't this cute? A miniature ironing board & iron with a Jo Morton tiny quilt. I enjoy Bug Jar & I Spy quilts. I've never seen fish bowls . Too cute! How the triplet's quilts are being used. I bought cute whale fabric & when I got home I saw what I thought were unicorns on some of the whales. Strange I thought?? Never heard of unicorn whales. I posted a picture of the fabric on Facebook & people commented that these were NarWhales. They have a tooth sticking out of the top of their head. A real type of whale. Who knew???! I got a science lesson that day. 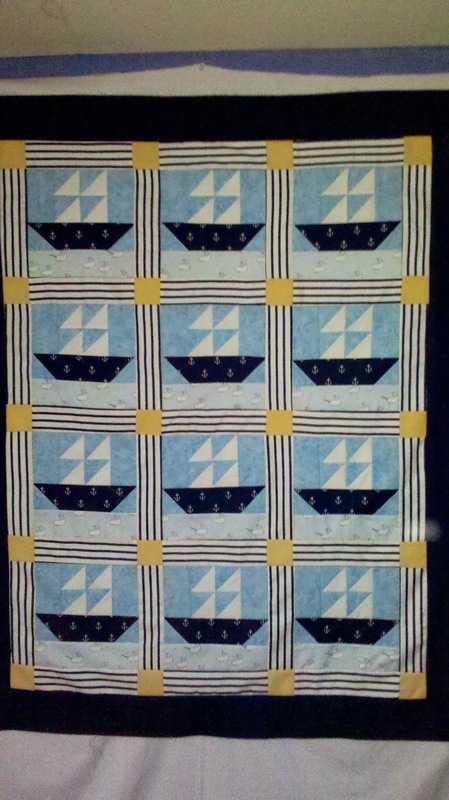 Here's the finished NarWhale & Sailboat quilt. Not all the whales are NarWhales in the fabric. The close-up photo shows a couple of them. My nephew's wife is having triplet girls TODAY! They already had the names picked . Kinley, Grace & Maylin. Fortunately they didn't use all the same initial so I was able to use just one alphabet panel. All three the same pattern. Just different bindings .Fabric is Windsor Lane by Bunny Hill Designs for Moda. A quilt for my friend's 28yr old son .Since he IS a bachelor, I thought this quilt with the name "Bachelor Quarters" would be perfect for him. He ok'd the pattern & told me the color scheme he wanted. I have 2 borders to put on yet. A small dark red( same as the small cornerstones in the blocks) & then a 6" print( the same as the larger cornerstones) . Fabrics are all batiks. A friend of mine asked me to make her a quilt. She showed me fabric ( old draperies) & said these were the colors she would like to have in her quilt. I asked her if she was using the drapes. She wasn't so I suggested that we make the quilt from the drapes. While I was making this, I kept thinking of Scarlet O'Hara in Gone with the Wind & her dress made of drapes). My friend chose a simple star pattern. 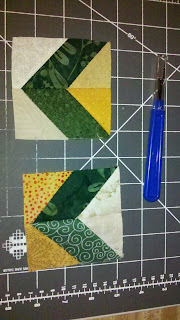 I used Kona Snow for the background & picked out a blue/green for the border. She also asked if I'd make pillow shams. ( a "first" for me) . The quilt measures 90"X 90" & I hand quilted around the stars. The shams are also hand quilted. I made a 16" pillow cover too ( not pictured) . My great-niece, Indigo, was born in December. She lives in Guam. I was looking for just the right fabrics to make her a quilt. Recently, I came across a line of fabric by Moda called Indigo Crossing. I HAD to buy it & make the quilt. I started out with a 4-patch, thinking I'd just make a simple 4-patch quilt. But it just didn't suit me so..went online & found Indian Star made from a 4-patch base.This is the result. I love it! Now to pack it up & send it off to little Indigo. I had recently purchased the "galaxy" fabric just because I liked it. You know how that is :) A few weeks later, I saw this quilt on the cover of an old quilt magazine that I got from a free magazine swap at my local quilt store. 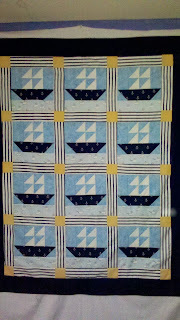 I HAD to make it~ The colors are deeper than the photo shows.I like the deep blue stars & swirls fabric I found as the large border. Almost wish I had made it a little bigger. But this will be a nice kids quilt. I've had these firefighter prints for many years & finally decided to do something with them. Just a small kids quilt . 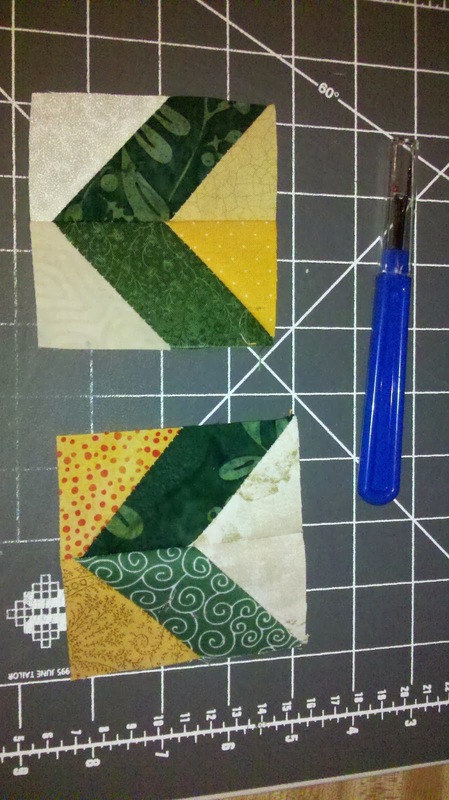 Simple fleece backing & diagonal machine quilting. This is a Christmas Sampler from the same company, Stoney Creek, that I'm using for the Christmas stocking( previous post) . I thought I did it just a couple of years ago. When I got it out, I saw the year 2007! My, how time flies! I will be getting this framed this year so it can go up on the wall THIS Christmas. You can't see it in the photo but many of the stitches have a gold thread added to the DMC floss. A beautiful day to take pictures of some of quilts & a cross-stitched piece. A cross-stitch Christmas stocking in progress ( it's only been abt 2 yrs now..half way there!) A Firefighter's printed quilt. I'm seeing Fire Engine Red!! Another I Spy for Jax( see previous post) . One for MeMom's house & one for "naptime" at preschool. This quilt will stay at MeMom's. I've made my grandson several quilts but this is the first I Spy. It will be for him snuggling here with me or his P-Pop. Jax loves fleece so that's what a backed it with.I had it on the couch when he came over. He saw it & said" MeMom, you made me another quilt!" Love my little guy!! Pineland Treasures ,Barb & I got together this week & cut the last step to this wall hanging called SPRING. I was able to finish mine & embellished it with some butterflies & put a border on it. It's really too big for any of my walls in my house( except my design wall) . I think I'll add another border & make it a throw. Barb's SPRING is also shown but without the last step sewn. It was fun to audition fabrics for this project. Now we have to look for something else to work on together. My neighbor,Barb (Pineland Treasures) & I are working on a new project. We get together to audition & cut the fabrics & then go to our own sewing machine to sew at our leisure. It's fun.Yesterday's section # 6 (not shown in this photo) took us abt 2 hours . Small detailed pieces to cut & of course a lot of chatting goes on. We first did this when working on the All Roads Lead to the Sea quilts. It's been awhile & we missed working on a project together. My quilt is the top one. Barb's , the bottom. Except for the pattern it's self, we are totally doing "our own thing". Mine is more tradtitonal looking fabrics. Barb's is very whimsical. Easy Street has taken over my sewing room~ But I see the end in sight. Today we celebrated our friend's 92nd birthday( actual BD Jan 2nd) .Pictured here is our usual group of girls. A few girls have come & gone but Miss Billie,Del,my mom( seated in blue shirt) & I have been stamping on Wednesdays for over 16yrs.Our friend, Hope, has been with us for several yrs now .We missed a few Wednesdays here & there but pretty much a sure place to find us ,around my kitchen table, every Wednesday.Lots of fun & great fellowship. We stamp from 12:30-3 & always have a break abt 2pm for tea & a snack. An interesting tid bit.. Miss Billie was my Sunday School teacher when I was a little girl.Of course, then I called her Mrs Layton. This is the t-shirt quilt I made for my brother-in-law( pictured). He's a retired Casper,Wy firefighter. All the t-sirts were either dk blue or black & most said the same thing. There were a couple that had a fire school he'd attend every couple of years. One t-shirt shows that he was captain. But most just said Casper Fire Dept or had the emblem on it. I had to fill in with 2 extra blocks so I added the year he started & the year he retired. I backed this with a light blue fleece that had trees & moose( is that the plural more more than one moose? lol) It was a surprise for him & my sister said he was thrilled. Yeah! When I'm not sewing Easy Street clues, I'm working on this log cabin queen size quilt for a friend. I have to make 24 blocks. 5 more blocks to go. I didn't give her a date as to when her quilt would be finished. But the log cabin is an easy pattern & is going fast. 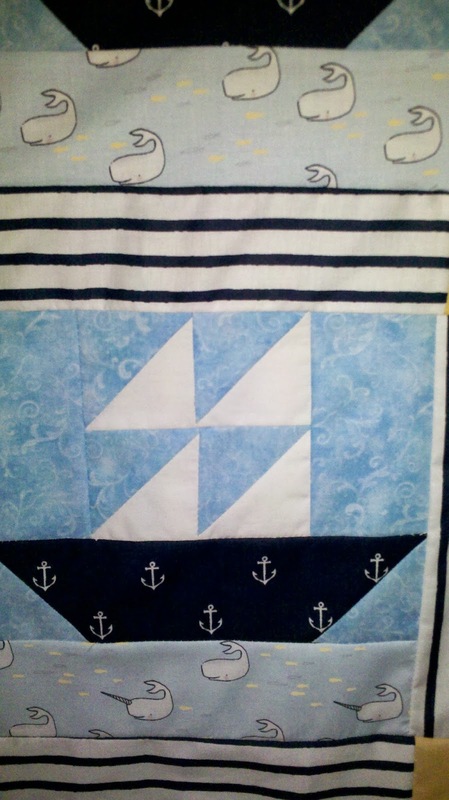 I also talked my friend into having it long-arm quilted instead of me hand-quilting it ! That way it will be on her bed much quicker. My cousin, Donna, & I officially started the Easy Street Mystery quilt. Almost all of the grey, black & white pieces are cut & ready to sew. My solution to "not enough fabric"
In a previous post & also on Facebook, I asked my friends to see if anyone had some extra fabric I needed to finish a quilt. Many people checked & even looked in Lancaster for me, Thank you all! The print was not found . I went to plan "B". I thought, If I was in a 3rd world country, I'd use every bit of the fabric I had, not just throw away the scraps. I dug in my "throw away" basket & found enough pieces to make it work. I had to make 5 of the 2 1/2" corner blocks. Yes, They were "franken-blocked" .It was around the same time as the Franken-storm, Sandy, was about to hit our NJ shore. The reason for the name Franken-block. I also thought, since it was for my mom who lived during the Depression, she would appreciate my frugleness.I showed it to her yesterday & she didn't even see the blocks at first. Hoping to have the hand quilting finished for Christmas. Well. It's been a couple years in the making, My Roll Roll Cotton Boll quilt is totally finished. I hand quilted this . That's what took so much time. But now I can say ..wow, I did this!